This may surprise you, but it’s been almost five and a half years since Bioshock was released. If anything, that makes me feel old. 2007 was quite awhile ago, and it’s safe to say a lot has happened between then and now: The iPhone (which, ironically, my 2007 edition of Word is underlining in red), President Obama, and that other Bioshock game to name some. 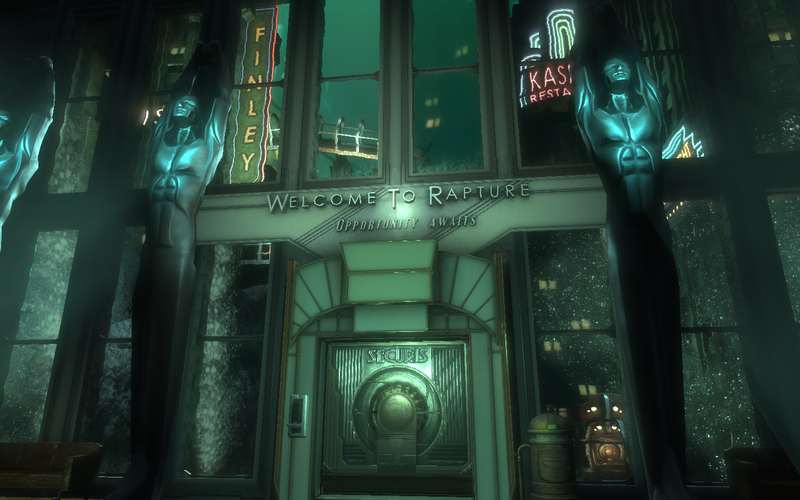 And on the advent of the spiritual sequel to the world of Rapture, it’s only fair to take a look at what it was in the first game that made it what we remember it for. “Ugh” they think, despondently, “is he going to witter on about the story again?” Yep. 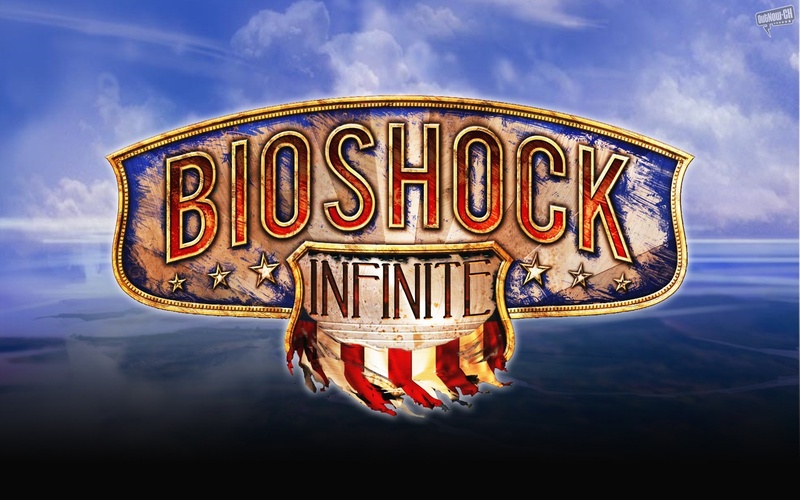 Bioshock has, since its creation, been held up as one of the shining examples of a game producing an excellent, immersive, refined and emotional storyline that doesn’t appear to fight the existence of the player from start to finish. Its awards are numerous and wide-reaching, so it’s safe to say they may have a point here. In terms of overview, we are plunged into the time-frozen city under the sea designed as a Capitalist Utopia circa 1960 that fell into revolution and eventual ruin through its own “all is fair” ideology. The introduction ADAM, a gene-altering sea-slug… drool… that is both the driving force behind the narrative and the key aspect of gameplay and its mechanics is the cause of the revolution. The entire setting is a “what if…?” scenario that creates what could almost be seen as an isolated social experiment. But with mutants. And fists of lightening. As the player we are brought into the city through Jack. Jack is a figure that is simultaneously devoid of any traditional character traits and full of them. Because of his initial anonymity- even the name Jack is barely implied- he is a clean slate, making him easier to inhabit as the player. What this does is key to the power and success of the story, because the story is completely hinged on Jack’s presence in rapture. But he isn’t formed. He isn’t a Gordon Freeman (Half-Life) or a Faith (Mirror’s Edge), and in doing so it doesn’t risk alienating the player from the game; we are freer to see the story from our point of view, opposed to the implied one of a pre-made character, and the story is vindictively cunning. It’s a series of subtle escalations based on shifting the parameters, based on what the characters in the game are, in relation to you at any one time. Are they friend or foe? What about now? It’s hardly clear-cut and arguably never is. But we still have to listen to them, and by doing so you are a part of the story and the setting, opposed to some gun-toting hardball whose only interaction with the world he passes through is to colour it in with blood as if it were some sort of abattoir/nursery crossover. The characters we meet have a very specific relationship with the world they reside in: every one of them has a tangible purpose for where and how they inhabit Rapture, the result being that the player often feels like a pawn being shoved in various directions for each of these purposes. Instead of the traditional “go there, do that for me” system, Bioshock has the constant, overarching objective of surviving (preferably with morality intact) that grounds Jack as a figure in his own right. Even the Big Daddies and Little Sisters are a constant reminder of a function of the city, and a visual cue of the harrowing extent people like Andrew Ryan were willing to go to so to succeed in his dream. Then there is Rapture itself. I’ve actually read some academic stuff about Bioshock. It was remarkably dull. But what it, curiously, suggested was the value of Rapture as another character over the game world. 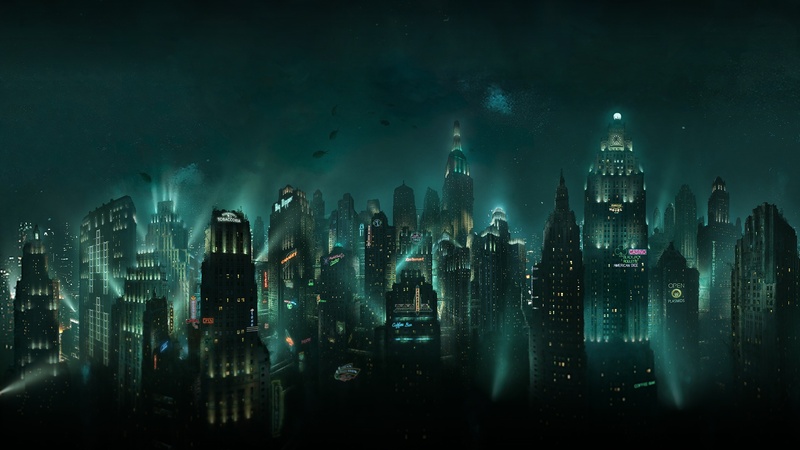 Rapture is a dying city being picked apart from the inside by the ideology it was meant to embody. As we pass through it we are reminded all the time that the city is past its last legs; the cascades of water seeping in, the signs of civil war, the insanity of its remaining inhabitants. It all adds up to an environment. One that isn’t just there to be squandered while the player wheels his way to the next fight scene, but instead is as intimidating and confining as the characters. What was always discussed as Bioshock’s greatest letdown was the actual gameplay. You play Bioshock for the story and Bioshock 2 for the gameplay, is what they used to say. And in essence they are right. Bioshock was clunky and ham-fisted in terms of controls and flow, but it was relatively easy to look past it. The guns were varied and amusing while having specific merits, and the Plasmids -the physical result of ADAM- proved to be entraining and diverse. What was unique here however was that in an industry that almost always favours gameplay over story, the story won out regardless. 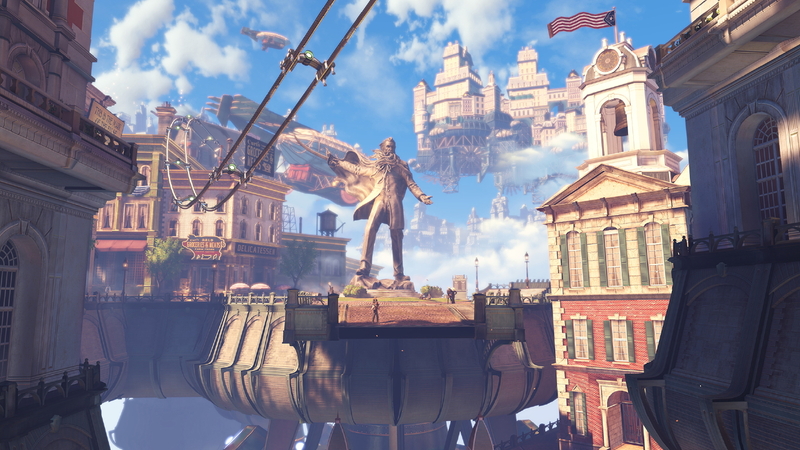 So what am I expecting from Bioshock: Infinite? Bigger? Better? As I write this, I am informed that several big name game news sites already have their reviews of Infinite up for us lowly and unworthy civvies to gawp at. And I’m almost certain that all of them are helping to polish the giant bronze statue of Ken Levine that is inevitably being erected over at K2 HQ. It would therefore be foolish to not expect something amazing from this spiritual sequel to one of the most successful games to date. But I’m not exactly hoping for the same. Well, obviously, you say, the setting is totally different for starters, as well as player/character relationships, abilities, content, scale and storyline. True on all counts. But looking through the trailers and the gameplay footage and the walkthroughs from the Devs and all that, I get this feeling like I’ve already played this game five and a half years ago, only it was underwater and had less revealing corsets. It’s as if the traits of the Bioshock we knew from half a decade ago are rightfully present in Infinite, but may become stale before the immensely sized story is through. Obviously I haven’t actually played it yet, as my copy is more than likely in a delivery van stuck in a 400ft snowdrift somewhere near Battersea or whatever, and I didn’t get an early copy as Ken, the scoundrel, never replied to my love letters. But there is this niggling feeling that they might have sacrificed something in Infinite just to move it far, far away from Rapture. But in balance, what they already appear to have made is something perhaps more spectacular in doing so. Only time will tell. Hell, maybe I’ll even be allowed to review the game for GTN as well. Although I suspect they will shout at me and tell me to get back into the corner and learn to write something productive and interesting and coherent and nice. In that case: Back to Rapture I go.